Metro Mining has announced its first shipment from the Bauxite Hills mine in Queensland to China. The 62,000t shipment is to be delivered from the Bauxite Hills mine (around 95km north of Weipa in Queensland) to Shandong, China via the Hong Kong cargo vessel Spring Oasis. The delivery will be handled by Xinfa Group, one of China’s largest integrated aluminium companies, which has a four-year off-take agreement with Metro. 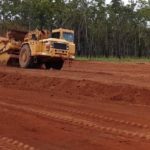 Metro started mining at the Bauxite Hills project in April 2018 with a team of 200 workers, having secured government approvals for a 10 million tonnes a year (10Mt/y) operation. The company has set an initial 2Mt/y target, with ramp up to a potential 6Mt/y over a four-year period. Metro previously announced some commissioning issues with its first shipment due to interference from a late wet season and hydraulics issues with its truck and haulage fleet but is now back on course. 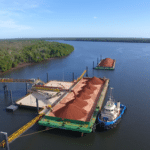 The company loaded bauxite from site to ship at an average over 7000t/day, and Metro expects to reach its 2018 target of 10,000t/day by June. Under the terms of the off-take agreement with Xinfa, Metro is to deliver 1Mt/y in the first year of the agreement, followed by 2Mt/y for the remaining three years. Metro managing director and chief executive officer Simon Finnis extended his congratulations to the company on achieving its first shipment. “Whilst the first shipment is an extremely exciting event it is also very demanding and has been another job well done,” he said.